Jelle Vanendert (Omega Pharma-Lotto) won the mountainous 14th stage of the Tour de France on Saturday as Thomas Voeckler mounted a surprising, spirited and successful defense of his yellow jersey. Jelle Vanendert (Omega Pharma-Lotto) won the mountainous 14th stage of the Tour de France and took over the polka-dot jersey on Saturday as Thomas Voeckler (Europcar) mounted a surprising, spirited and successful defense of his yellow jersey. Vanendert and Voeckler were part of an elite group of favorites testing each other on the final climb of the day, the hors catégorie Plateau de Beille. As Leopard-Trek teammates Andy and Fränk Schleck took turns attacking the group, with Ivan Basso (Liquigas-Cannondale) getting in his licks and BMC’s Cadel Evans shutting down everything that moved, Vanendert shot off the front and chased down Sandy Casar (Fdj), who had ridden away alone in hopes of collecting a first French stage win in this year’s Tour. It was not to be — Vanendert overhauled him and rode on for the victory as the GC riders danced and feinted behind. Samuel Sanchez (Euskaltel-Euskadi) escaped the group to take second, while Andy Schleck launched one final attack to land on the lowest step of the podium, collecting two seconds’ advantage in the process. Defending champion Alberto Contador (Saxo Bank-Sungard) played defense on the stage, never attacking but doggedly hanging on as the others took their digs. And the man who was wearing the yellow jersey was hanging on, too — much to his astonishment. 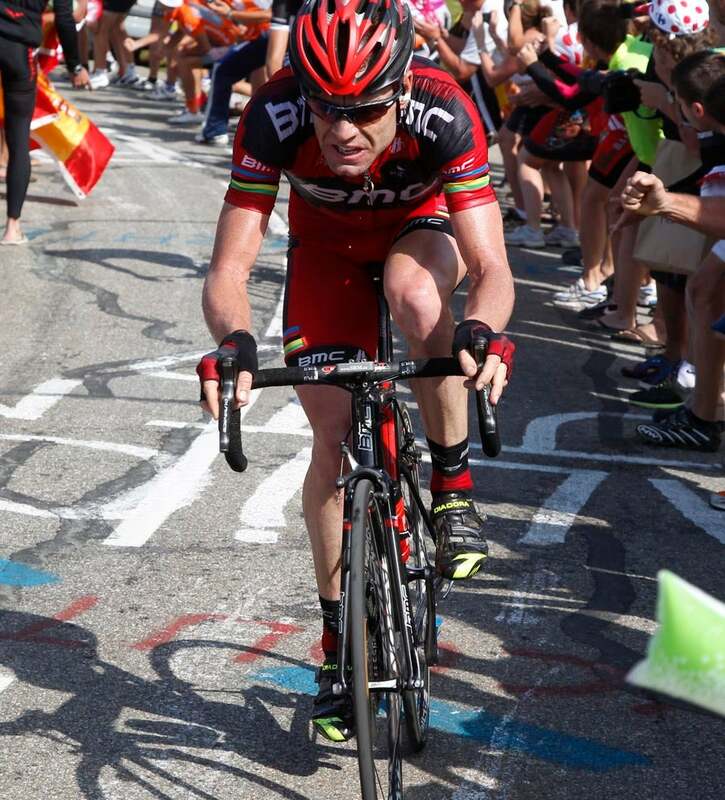 BMC’s Cadel Evans, fourth on the day and third overall, expects him to keep it a while longer. The day dawned warm and sunny for the 168.5km race from Saint-Gaudens to Plateau de Beille, which served up six rated climbs for nearly 16,000 feet of climbing, including the hors catégorie climb to the finish. It marked the fifth time that the Plateau de Beille has been the scene of a Tour de France stage finish. Each time it’s been used — in 1998, 2002, 2004 and 2007 — the day’s winner also went on to win that year’s Tour. ● The Category 2 Col de Portet-d’Aspet (1,069 meters), 4.3km, 9.7 percent, summited at km 26.5. ● The Category 1 Col de la Core (1,395m), 14.1km, 5.7 percent, summited at km 62.5. ● The Category 2 Col de Latrape (1,110m), 5.6km, 7.2 percent, summited at km 94. ● The Category 1 Col d’Agnes (1,570m), 10km, 8.2 percent, summited at km 109. ● The Category 3 Port de Lers (1,517m), 3.8km, 5.5 percent, summited at km 118. ● And finally, the Plateau de Beille (1,780m), 15.8km hors catégorie climb, 7.9 percent, summited at 168.5km. The race was aggressive from the gun, and a big break went early, just 8km into the day’s labors. Leopard-Trek put Jens Voigt and Linus Gerdemann into the escape with an eye toward helping the Schleck brothers later in the stage. Seven riders were chasing that big group: 40. Jérôme Pineau, Quick Step, at 22:01; 74. Adriano Malori, Lampre-ISD, at 53:23; 82. Ruben Perez Moreno, Euskaltel-Euskadi, at 59:16; 85. José Ivan Gutierrez, Movistar, at 1:00:38; 86. Alberto Costa Rui, Movistar, at 1:02:32, 129. Francisco Ventoso, Movistar, at 1:29:56; and 135. Maxim Iglinskiy, Astana, at 1:33:28. At 20km the break had 1:55 over the chase and four minutes over the bunch. The chase shed Ventoso, Iglinsky and Gutierrez, who eventually drifted back to the peloton, and caught the break at 46km, leaving a 24-rider break out front with 5:46 over the bunch at the lower slopes of the Col de la Core. El Fares, Casar and Millar tried a dig out of the break, and with 87km to go the trio had more than a minute on their erstwhile companions, as the Europcar-led bunch noodled along at more than seven minutes back. As the trio’s advantage approached two minutes Riblon launched an attempt to bridge. Behind, Leopard-Trek replaced Europcar at the head of the chase and riders started going backward, among them polka-dot jersey Jérémy Roy and Friday’s stage winner, world champion Thor Hushovd (Garmin-Cervélo). Riblon joined the lead trio and Millar faded out of it. Voigt rode up to the leaders as well, and with 60km remaining there were 11 riders at the front of the race, climbing the Col d’Agnes —Voigt and Gerdemann (Leopard); Izagirre Insausti (Euskaltel); Di Gregorio (Astana); Riblon (Ag2r); Zandio (Sky); Casar (Fdj); Silin (Katusha); El Fares (Cofidis); Charteau (Europcar); and Chavanel (Quick Step) — with men scattered about between them and the bunch at 7:15 down. Philippe Gilbert (Omega Pharma-Lotto), who burned a lot of matches in Friday’s stage hunting green-jersey points, slipped off the back of the yellow-jersey group as Leopard’s Stuart O’Grady pounded out a tough cadence, with Fabian Cancellara on his wheel. Nicholas Roche (Ag2r) was also in difficulty and losing the wheel. Laurens Ten Dam (Rabobank) overcooked a corner on the descent of the Agnes, went over the bars and took a header into the weeds. Word was that he broke his nose in the crash — nevertheless, he remounted and continued. Up front, Euskaltel’s Izagirre Insausti decided to go it alone on the Port de Lers as the Leopard-led chase began closing in, to within five minutes with 51km to go. Gilbert, meanwhile, fought his way back to the bunch. Izagirre Insausti went over the top alone with about a minute in hand over the original break with the yellow-jersey group at 5:20. On the descent, Voigt overcooked his own corner and shot straight off the road and down a grassy slope. He clambered back out, got a wheel and soldiered on, only to hit the deck again further on down the road as the front wheel slipped out from under him in a right-hander. With 34km to go Izagirre Insausti led the chase by just over a minute with the yellow-jersey group at 5:15. The chasers began attacking each other in the valley leading to the final obstacle of the day — the 15.8km, hors catégorie Plateau de Beille. Millar had latched back on, and promptly had a dig, to no particular effect, but the upped pace saw the chase finally swallow up Izagirre Insausti with 24km to race. Chavanel was next to go — he clearly wanted company, but didn’t get it, and so carried on alone. Behind, the Leopards had closed the gap to just over three minutes. Perez Moreno and LL Sanchez finally decided to join Chavanel up front, with a few kilometers to go before the final ascent. A five-man chase formed up just behind, with the remainder of the escape raising the white flag and waiting for the peloton. The trio sat up briefly to let the five chasers catch on, and then Perez Moreno attacked going into the base of the climb, taking a slight lead. Leopard’s Jakob Fuglsang and then Maxime Monfort led the bunch onto the climb, two minutes behind Perez Moreno. HTC-Highroad’s Tony Martin instantly went backward, as did Rabobank’s Robert Gesink, but yellow jersey Voeckler was hanging tough. Voight was next to take over the pace-making. Cadel Evans (BMC) was lurking nearby, as were HTC’s Peter Velits, Lampre’s Damiano Cunego and the Schlecks. Christian Vande Velde and Tom Danielson (Garmin) were there, too, as was Roche, who had managed to get back on. Casar and Riblon were now at the head of affairs, and soon Casar was alone, 1:45 ahead of the yellow-jersey group. Carlos Barredo (Rabobank) and Rui Costa (Movistar) moved ahead of the chase as Roche once again slipped off the back with 13km to go. Vande Velde was setting pace with Danielson on his wheel and Voeckler sitting third as the Schlecks marked Contador. And then Andy Schleck jumped, with Contador on his wheel. Vande Velde and Saxo Bank’s Daniel Navarro were immediately shelled, but Ivan Basso (Liquigas-Cannondale), Evans and Voeckler hung tight. Casar hit 10km to go with 1:23 over the chase, now led by Europcar’s Pierre Rolland. And then Andy Schleck attacked again, with Vanendert oon his wheel. Evans, Basso and Voeckler followed, but Contador was late to make an effort and took a moment to latch back on. Andy Schleck attacked again, Voeckler followed, and Evans chased, dragging the rest along with him. Fränk Schleck had a go next, with Evans on his wheel and Basso third. Contador was there, with Voeckler. Rolland took the front to set pace for Voeckler. Ahead, Casar clung to a 47-second lead with 7km to race. Andy Schleck went again, and Contador followed. Once again Evans dragged the others up to him — among them Voeckler and Vanendert, who then rode straight past them, making his own bid for the stage win. The yellow jersey took the front next, looking round to gauge the strength and size of the group. Ahead, Vanendert had caught Casar and shot past, the finish just 6km up the road. Basso took the front next as a cease-fire of sorts was declared, the yellow-jersey group down to 10 or so. Cunego was briefly distanced, but Voeckler hung tough, and the chase was within 28 seconds of Vanendert with 5km to race. Basso tried a little dig in a corner, but Voeckler and Evans were right on him. He accelerated again, to no real effect, barring the departure of Cunego once again. Then Samuel Sanchez attacked, followed by Andy Schleck, and Voeckler chased with Evans and Contador. Sanchez went again and this time took a gap — Voeckler was looking around for help, and Evans once again took up the chase. Andy Schleck then took the front, Voeckler on his wheel, as Sanchez rode away. With 3km to go the favorites remained together, with Basso setting the pace — and then he rode away. After a moment, Voeckler followed, and then Evans attacked. Andy Schleck was on him, followed by Voeckler, Contador, Basso and Jean-Christophe Peraud (Ag2r). Vanendert hit the final kilometer with 54 seconds’ advantage over the seven-man chase, with Sanchez at 24 seconds. He sailed across the line alone, grinning, both fists in the air. “I came to this Tour in great condition,” said Vanendert, who took the lead in the mountains competition by two points over Samuel Sanchez. “I was very strong in the spring classics and then I took a break, with a training camp in Italy and later the Dauphine. The team supported me and I am in my best shape now. Sanchez hung on for second and Andy Schleck launched a final attack — he crossed third, ahead of Evans, collecting only a couple seconds over the others for his troubles. Race leader Voeckler was delighted at having been able to stick with the favorites to the finish. “I was able to follow, but I was really suffering — but that was the same for everyone,” he said. “The objective today was to keep the yellow jersey. I expected to lose some time today and I thought it would be a question of seconds. I never thought that I would be able to stay with the favorites. There will be other accelerations once the race hits the Alps, warned Andy Schleck. Older brother Fränk, meanwhile, had a little dig at Contador and Evans, criticizing the pair for what he clearly perceived was a lack of aggression. “Everyone says no one attacks, but you have to consider also the wind, and the closeness of the racing,” he said. Patrick O’Grady, Andrew Hood and Agence France Presse contributed to this report. Stay tuned for an expanded report, photos, videos and more from stage 14 of the 2011 Tour de France.